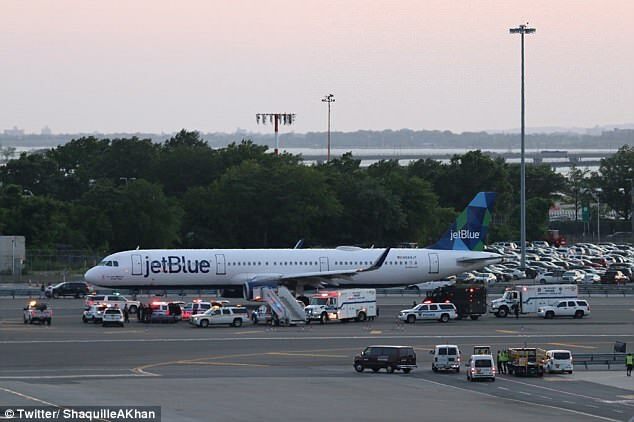 The wrong radio code sparked fears that a JetBlue flight bound for Los Angeles had been hijacked leading to a massive police response on Tuesday night at John F. Kennedy International Airport in New York. 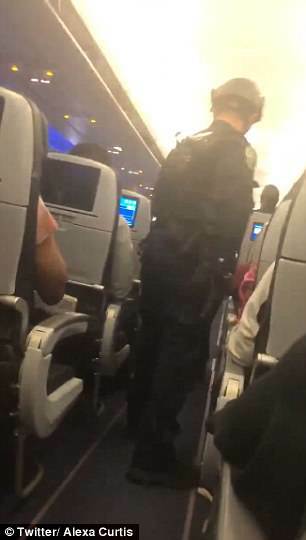 As Port Authority police and firefighters surrounded flight 1623, dramatic video taken inside the plane by terrified passengers shows armed SWAT members storming on board and searching the aircraft as travelers were told to keep their hands in the air. There are conflicting reports on what led to the incident being label a hijacking. The New York Post reports that a JetBlue pilot accidentally signaled to air traffic control that his plane had been hijacked. The pilot had apparently told controllers that the aircraft was having radio issues, but mistakenly used the code for a hijacking. Dozens of officers responded surrounding the plane on the tarmac around 8pm stopping it from getting near the terminal. 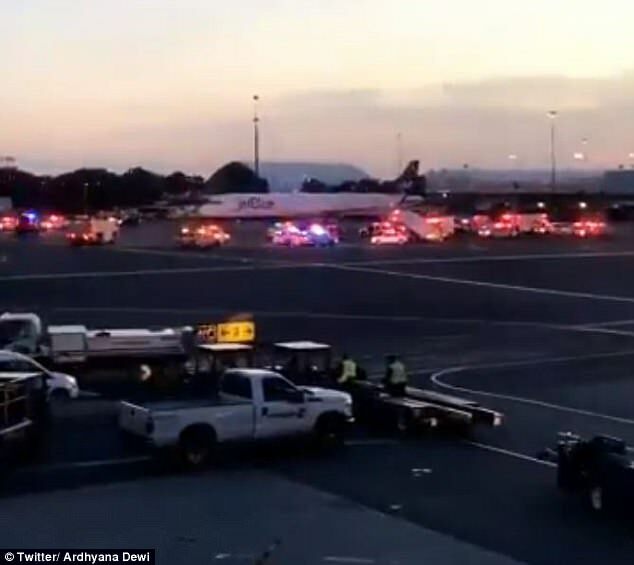 The New York Daily News, cited a source as saying that tower personnel pressed the hijack alert button after five minutes of no communication with the plane's pilots. According to the outlet, at one point the pilot held up a piece of paper with his cell phone number on it so police could call him and find out what happened. A spokeswoman for JetBlue called the incident a 'false alarm'. 'Shortly before departure, Flight 1623 from New York JFK to Los Angeles experienced a radio issue impacting the crew's ability to communicate and a false alarm was sent to JFK tower,' she said in a statement. A Port Authority spokeswoman said the plane 'was inspected and cleared with no security threat', the Post reports. 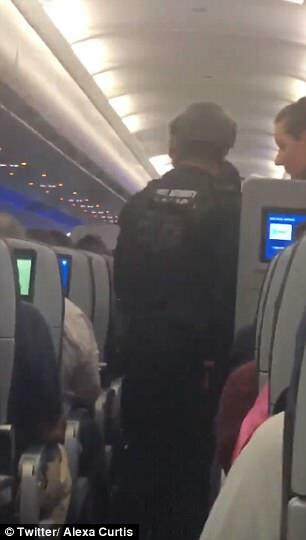 It was reported earlier Tuesday night police responded after the cockpit had stopped communicating with tower officials. Department of Homeland Security and the FBI were said to be on the scene. 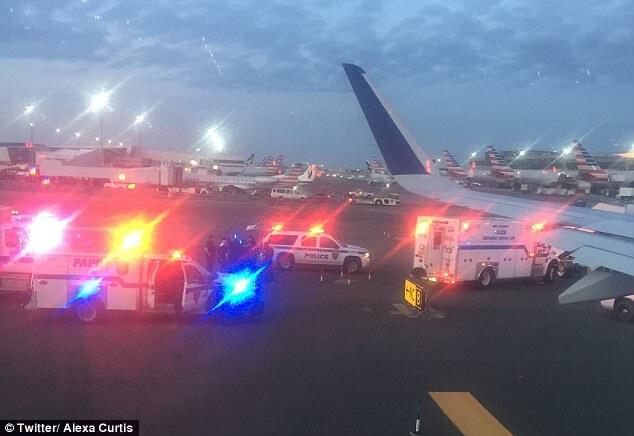 The Federal Aviation Administration released a statement saying the aircraft 'experienced a radio equipment problem while taxiing for departure at John F. Kennedy International Airport'. The LAX-bound flight departed the gate just before 7.30pm but never left the ground. 'The crew requested to return to the ramp. The FAA will investigate,' the statement continued. It was later determined that the aircraft experienced a broken radio but air traffic controllers initially feared that the plane might have been hijacked after the pilots stopped communicating. About 30 minutes into the incident, dozens of police had the plane surrounded. 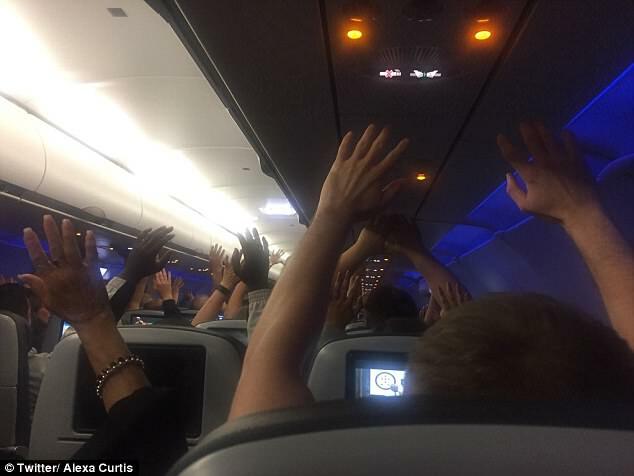 Terrified passengers tweeted photos from inside the aircraft saying they were told to put their hands in the air as the plane was searched. They spent about 90 minutes on the plane before they were allowed to leave. 'Woah. My worst nightmare. JFK to LAX right now, honestly thought we were going to die,' tweeted passenger Alexa Curtis. 'I AM ALIVE THANK GOSH I MEDITATE U GUYS what is going on'. Curis, a blogger from California, later tweeted that the incident was 'traumatizing'. She said hundreds of people are now stuck at JFK trying to figure out to get to Los Angeles, where the JetBlue flight was headed. Another passenger, Tony Schwartz, tweeted that ten 'heavily armed guards' stormed the flight. The plane was stuck on the runway for an hour-and-a-half before it was towed back to the gate. 'I've never been told to put my hands up on any plane': Passenger Daniel Cruz said the incident was 'super scary'. The aircraft was eventually cleared and no one was in danger. 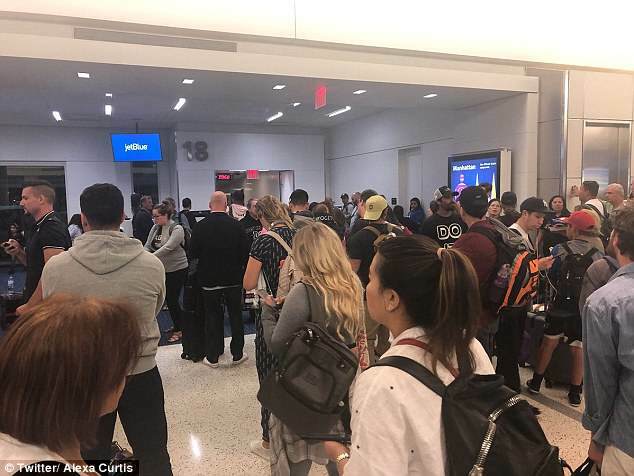 Passengers began tweeting late Tuesday night that they had been put another flight to Los Angeles after a new pilot arrived. 'A supposed new pilot (not too sure) is here and the boarding has begun! I haven't been able to take any calls due to boarding in progress. 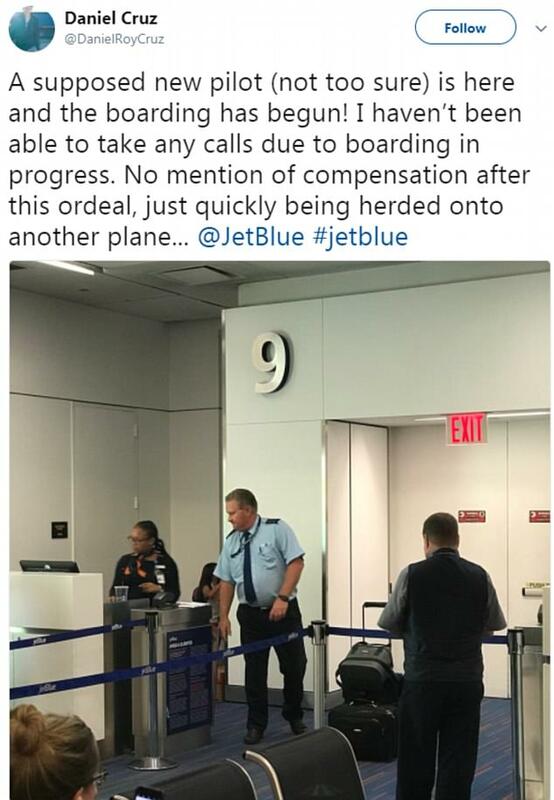 No mention of compensation after this ordeal, just quickly being herded onto another plane,' passenger David Cruz tweeted, around 9:15pm, more than an hour after they were forced off the plane. 'What a day,' he continued, adding that they are expected to land around 5am EST.